Home for Cars in Coachella! HITS Thermal Horse Park around the corner from the Thermal Club, entry on Airport Blvd., Thermal, CA. The Thermal Club is located off of Avenue 62 in Thermal, California. A private club, that interested parties may purchase a plot at to build one of a series of custom Villas. These Villas are built to your specifications, and are available both facing the Race track and off track. There are three courses to drive at the Club, with a total of 20 configurations which can handle F1 to vintage motorsport racing. There is a clubhouse, dining options, and other “things to do” for members of the family. The Public may purchase driving packages, to actually learn from a Professional driver, and then drive a racing type car. The location of the club couldn’t be better. Surrounded by Ag land, panoramic mountain views, and peace…what a great home for your car! 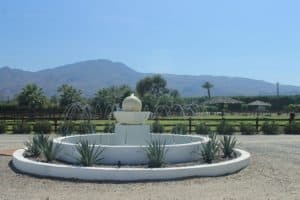 The HITS Horseshow is also centered in Thermal, off of Airport Avenue, and just down the street from The Jacqueline Cochran Regional airport. This Public airport enables East Valley visitors and residents to fly in quietly, and fly out just as easily. 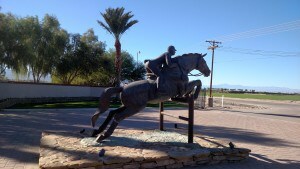 The Thermal Club is only 5 minutes away from the thriving City of La Quinta. If you love the starkness of the Thermal area, but want to live in a more populous area with more activities, choose La Quinta! Golf Course Condos & homes, gated, non-golf communities, and best of all..how about your OWN private estate to store and show your Car collection?